In late 1999, England's Professional Footballers Association (PFA) completed the purchase of LS Lowry's, 'Going To The Match.' A 1953 oil-painting of Bolton Wanderers fans going to the club's old ground Burnden Park, the association's chief executive Gordon Taylor believed that Lowry's work had encapsulated "the heart and soul of the game and the anticipation of fans on their way to a match". Part of a broader incentive to collect a portfolio of football memorabilia and artwork, the acquisition of 'Going To The Match' required the PFA to spend almost £2 million; a record-breaking purchase at auction for any modern British artwork. A fairly gregarious move given the PFA's primary purpose of attending to the well-being of England's professional footballers, Taylor's stated effort to "keep the picture in football" hinted at a strange dichotomy within English football that Lowry's painting only half-told. Coming a matter of months after Manchester United decided to forego their participation in the 1999/00 FA Cup for a shot at the Club World Championship in Brazil, could the concept Taylor cherished have been any further removed from the quaint importance of locality suggested in Lowry's painting? Apart from the relatively few who would make the journey to see United take on Necaxa, Vasco da Gama and South Melbourne in Rio de Janeiro, amid such circumstances 'Going To The Match' scarcely reflected the "heart and soul of the game" at all; appearing rather antiquated and twee by comparison. Yet, it nevertheless reflected what has been an ongoing battle for England's elite clubs. Representing the weight of footballing tradition, the pre-match excitement of a crowd coming to see their team play, such symbols are essential in cementing the notion that Lowry's matchstick figures, so simple as to be appropriated by people up and down the country, still matter at all. For all that they have done in contributing to the chasm between English footballing tradition and the commercialised product many of us enjoy today, Manchester United proffer the importance of locality nevertheless. By no means the only club to accentuate the importance of the past, the recently relegated West Bromwich Albion - in an attempt to appease fans who were undoubtedly displeased with the club slipping into the Championship - decided that this was the season for "cherishing history and embracing the future." Demonstrated with their new 1970s style away strip that hints at a time when the club were regularly among the top 10 of the old First Division, what better way to distract from the disappointment of the present than encouraging fans to look backward? With Manchester United, however, this task requires a bit more tact. Sure, they have released plenty of jerseys that hint at everything from the club's previous incarnation as Newton Heath to Manchester's use of Gingham in the 18th century. However, isolating one attempt at appropriating tradition above all others, the use of the Stones Roses' 'This is the One' before matches in Old Trafford is of particular interest. The reason why; because for so long it made such perfect sense. "It may go right / It may go wrong / This is the one"
Apparently adopted at the request of Gary Neville in the early 2000s, 'This is the One' became the song that would greet both the Manchester United players and their opponents onto the pitch at Old Trafford. As the songwriter, lead singer of the Stone Roses, and United fan Ian Brown revealed in an interview with The Guardian; "I wrote that tune in 1986 when I was on the dole, and there was no way I could have known that 20 years later United would be coming on to the pitch to it. It still gets me every time. It's an amazing feeling." 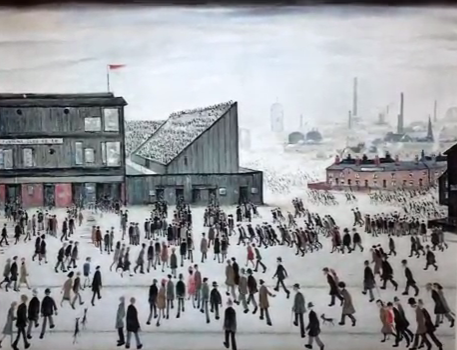 A song with no obvious affinity to football, it nonetheless captures the sense of excitement the PFA located in Lowry's painting; the very idea that this game, in this season, might be the one where you see something you could never have expected. In curious contrast to the almost Beckettian relentlessness of football's repetition, carrying on year after year after year irrespective of what you have won or lost, 'This is the One' provides a kind of optimism that so accurately surmised this period of Manchester United's history. Speaking with the Second Captains last week, Gary Neville, former player and still a fan of Manchester United, explained what he believes the club to be about; "Manchester United had a 100-year strategy. Appoint a British manager, play great football involving wingers and bring home-grown players through. That's it. Simple." Reaching its climax with the appointment of Alex Ferguson (ironically, in the same year Brown wrote the song), the simplicity of Neville's strategy reached heights that would arguably become United's undoing. It is possible to now overlook in exact detail the sheer magnitude of United's achievements under Ferguson, exemplified by the treble win of '99. Contrarily, one can be lulled into believing the hype with too much certainty. This, after all, has been a club with one eye on mastering the commercial world for some time - consult the oddly charming Beyond the Promised Land to discover just why Roman Abramovich's Chelsea were so keen to acquire the services of United's former CEO Peter Kenyon in 2003. However, demonstrating a crucial hold on those basic tenets that Neville identified throughout, the atmospheric presence of this Manchester band who had laid down a gauntlet for the surging revival of British rock'n'roll in the '90s only served to heighten the grips of tradition that held as the club expanded ever further. No matter how ruthless they (or subsequent owners) became in exploiting the market for financial gain, 'This is the One' hinted at the same sort of primal excitement and anticipation that Lowry had recognised in the 1950s. Although only 5 years have passed since Ferguson departed the role he had held since 1986, Manchester United no longer holds such promise. Debating the merits and application of tradition in poetics, TS Eliot surmised; "A tradition without intelligence is not worth having." 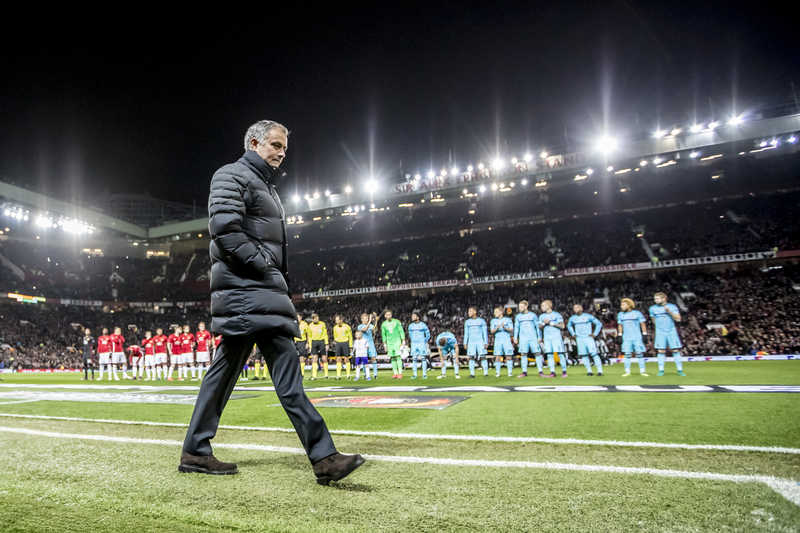 One feels Jose Mourinho would push Eliot further still. Rationalising the exit of Manchester United from last year's Champions League, Mourinho pointed out that the club had lost at this stage before. Hell, for good measure, he mentioned that he had orchestrated one such instance in 2004. Tradition holds no currency for this man. While 'This is the One' continues to ring out around Old Trafford before every home game, it has never perhaps seemed so flagrantly inappropriate. About more than the mere success of the team, it hinted at a sense of hope that is no longer evident in Manchester United's play. The last tangible, living remnant of the club's most glorious period of excitement and anticipation, it may as well be played on a loop in the vicinity of Lowry's painting at the National Football Museum. See Also: Is Social Media Really Ruining Sports Broadcasting?